Sumrina Khan gets the inside scoop on Honey Waqar’s latest bridal collection and what keeps the brand in a constant state of evolution. What was the design philosophy of this particular collection? “Maharani Mumtaz” is not just a collection, but an entire concept. While designing this collection, I drew inspiration from the fashion of the Royal Raj Mahal era, as I wanted to revive the splendor of that time period, with its regality and opulence. The idea was to capture the beauty and essence of women, and infuse that with a touch of fantasy. I like to keep it classic, so for me it would be an understated yet unforgettable black dress and my go-to Chanel earrings. What trends do you want to see more of in 2017? I love it when brides take a chance and play with colour, and this season it was all about balanced palettes – with warm rose quartz and cool serenity blue in particular. Along with shorter hemlines, I also really like the use of sheer fabrics, a look which has been recently adopted and one I hope to see continue on this year. Which trends are you ready to see die out? Tulip shalwars and the off-shoulder tops! They were current and relevant from a restricted time frame, but are not timeless like the classics. As a brand, you were famous for your traditional gota style work, but you have recently changed to more modern aesthetics. Why the change? Everything evolves with age and time, and consequently my style has grown with inspirations and trends from around the world. 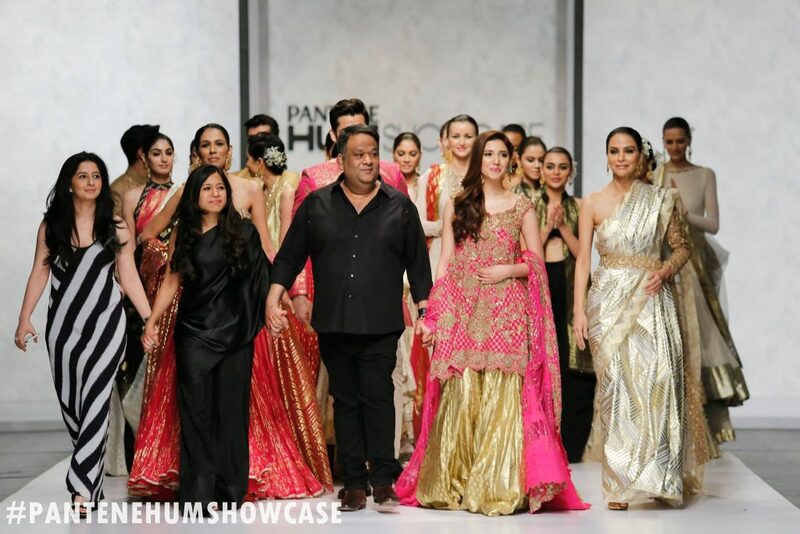 Each line was exclusive, exquisite and mesmerizing in the period that it was created, and each collection that follows showcases the evolution of Honey Waqar. In such a competitive market, how does one manage to stay relevant to your target audience? It’s a journey that sparked from passion, originality and, of course, a lot of dedication. However, I have always been analytical towards my work and feel I am able to infuse traditional styles with a modern sensibility, suiting the ever evolving world of fashion. I feel my qualities and strengths bring ingenuity to my work and have helped me to develop a distinguished design sense that appeals to women everywhere. How have you managed to accommodate the fashion industry’s focus on retail? In a demanding fashion retail industry like ours, it is harder for bridal couture designers to cater to such fast shifting market trends. Hence, we came up with our very own concept store. It acts as our display centre, flagship store for appointments and trials, and a retail store as well. This has helped us expand as a brand while staying connected with our clientele. What do you think sets you aside from the rest of the competition? What sets me apart from others is the finesse in my work, both in terms of design and finish. What dominates my creations is the vibrant and exotic colour schemes that I use, and the inspiration I take from heritage art. I strive to create something genuinely extraordinary and different with each new collection. I don’t need to look far! My muses are my beautiful daughters Shazreh and Mahnum, who carry my clothes to perfection! Among other invaluable lessons, my parents have taught me to believe in myself and be content, and instilled the art of generosity and forgiveness within me. “Fall seven times, get up eight.” There have been several incidents where I felt like giving up, but my belief in myself, patience, and commitment coupled with hard work, are the reason behind my success. Upcoming projects in the new year? 2017 is going to be a big year for us, as we’re launching our luxury lawn for the very first time. It’s been a long time coming and feels like the best next step for us, so stay tuned!